Well, it's not quite hardware, but say hello to Valve's SteamOS, a Linux-based operating system designed to bring PC gaming to the living room. "SteamOS combines the rock-solid architecture of Linux with a gaming experience built for the big screen," wrote the company when its official website's countdown ticker, started Sept. 20, reached zero. The benefits of Steam OS, according to Valve, include having your favorite games, online friends, and all the features of Steam, only now at the heart of an operating system designed for the big screen. It's also free, which is a boon for users and manufacturers who want to easily license the platform that already has thousands of compatible games and millions of users via the Steam client. As Valve put it, "We've come to the conclusion that the environment best suited to delivering value to customers is an operating system built around Steam itself." SteamOS will be available "soon" as a standalone operating system for living room machines, the company said. SteamOS will work with "any living room machine," plus let users stream Linux games from their Windows and Mac computers to a SteamOS machine. According to Valve, it reached "significant performance increases in graphics processing" with SteamOS, and now it's focused on improving audio performance and reducing input latency on the system level. The company teased that game developers are already using SteamOS' perks in creating new titles. The platform thrives on openness, which Valve takes to mean letting hardware makers iterate in the living room at a much faster clip than they're currently able to, among others facets. "Content creators can connect directly to their customers," Valve explained. "Users can alter or replace any part of the software or hardware they want. Gamers are empowered to join in the creation of games they love." 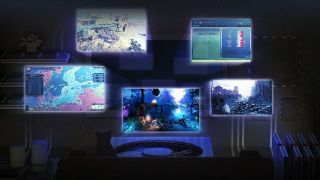 While in-home streaming is one focal point of SteamOS, Valve said it's also working on bringing music, TV and movie streaming to the new operating system. Family sharing and family options, like parental control, are also part of the SteamOS offering. All four features will make it over to the regular Steam system. SteamOS may foreshadow Valve's own, the long-teased Steam Box. While the company didn't announce living-focused gaming and entertainment equipment today, a Steam Box announcement may not be too far off. Right next to the expired SteamOS teaser is another countdown clock that started at 48 hours. And after Sept. 25's announcement, Valve is expected to host a third unveiling on its official website. We wouldn't be surprised if Valve decides to bookend the week with another announcement on Sept. 27. In addition to Steam Box expectations, gamers are hoping that the company unveils Half-Life 3, the long-awaited sequel to the Gordon Freeman-helmed first-person shooter. Read about Surface Pro 2 by that other Washington state based company.